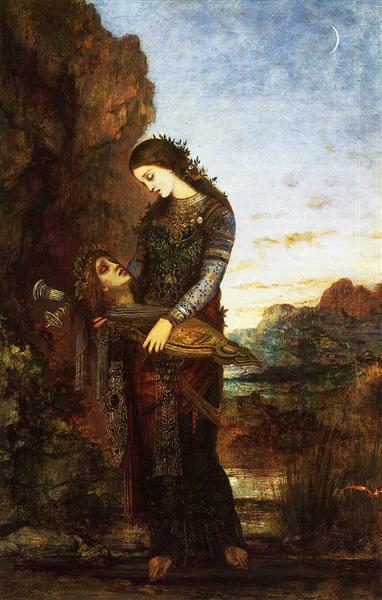 Oedipus and the Sphinx is an 1864 oil on canvas painting by Gustave Moreau that was first exhibited at the French Salon of 1864 where it was an immediate success. It is now in the Metropolitan Museum of Art. The work was a fresh treatment of the established subject of the meeting between Oedipus and the Sphinx on the road to Delphi, notably portrayed at Sophocles' play Oedipus Rex. The painting depicts Oedipus meeting the Sphinx at the crossroads on his journey between Thebes and Delphi. Oedipus must answer the Sphinx's riddle correctly in order to pass. Failure means his own death and that of the besieged Thebans. The riddle was: "What walks on four feet in the morning, two in the afternoon and three at night?". Oedipus answered: "Man: as an infant, he crawls on all fours; as an adult, he walks on two legs and; in old age, he uses a walking stick". Oedipus was the first to answer the riddle correctly and, having heard Oedipus' answer, the Sphinx was astounded and inexplicably killed herself by throwing herself into the sea. Oedipus thereby won the freedom of the Thebans, the kingdom of that city and a wife Jocasta, who it was later revealed was his mother. 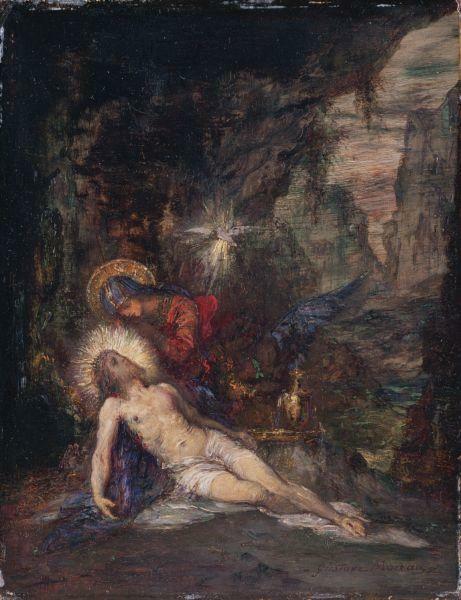 In this work Moreau deliberately rejects the realism and naturalism in vogue in mid nineteenth century France, instead adopting a deliberately archaic painting style and mythological subject matter. 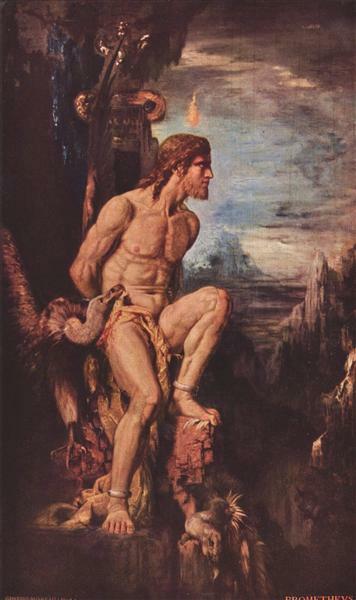 Moreau had sketched Ingres' 1808 Oedipus and the Sphinx in Paris and that is a likely source for his version of the story. Ingres also painted a later version (c. 1826) which is now in the National Gallery, London, but it is uncertain whether Moreau saw that work. The influence of Italian Renaissance master Andrea Mantegna has also been detected in Moreau's version. Unlike Ingres' version where Oedipus appears as the dominant figure with the Sphinx on the defensive and partly obscured, in Moreau's version the Sphinx is on the offensive, clawing at Oedipus whose victory in the encounter does not yet seem assured. 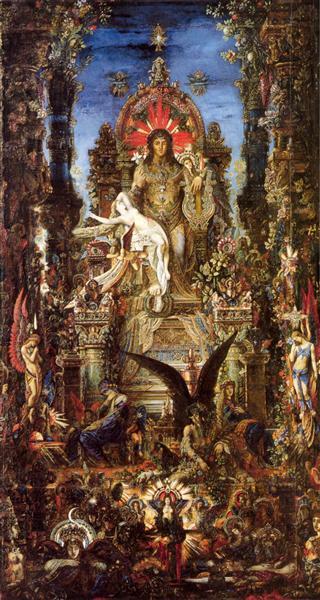 Indeed, other works by Moreau often feature victorious sphinxes atop a mound of victims. 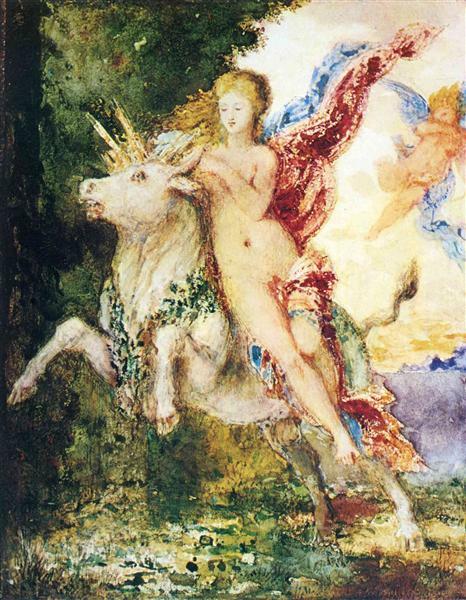 The Sphinx in the painting may be seen as a form of femme fatale, a common theme in late nineteenth century arts and particularly of Symbolist painting. Ragnar von Holten has argued that the subject depicts not only the battle between good and evil, but also between the sexes, and that the opening poem of Buch der Leider by Heinrich Heine was the source for the idea of the painting. In that poem the Sphinx triumphs over Oedipus. In a Freudian interpretation, it has been argued that the Sphinx represents the castrating effect of Moreau's mother that he has seeking to escape. 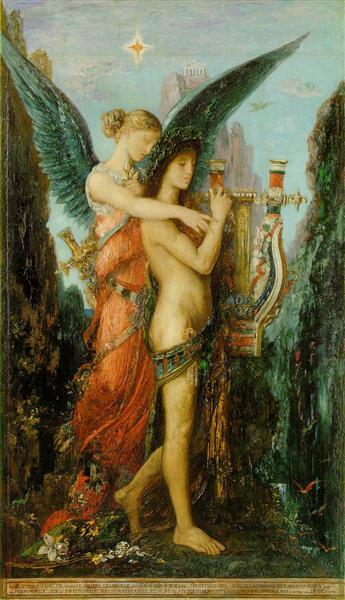 At the time the painting was created, Moreau's father had recently died. By contrast, Henri Dorra has suggested that the poses of the sphinx and Oedipus are derived from the Greek etymological meaning of the word sphinx, which is to clutch, embrace, or cling to. Dorra notes that a paper on the subject by Michel Bréal had been published in 1863, the year before the work was painted. Dorra also draws attention to the symbolic meaning of some of the elements in the picture, which could have autobiographical aspects, and the possible derivation of the treatment of the subject from the design of a Bithynian coin of Nicomedes II depicting Zeus leaning on a staff with an eagle on his right.